Can you imagine this was the first time hubby went to a KFC in France? Well, he went with me once in Malaysia, and once in USA, and he couldn't appreciate it. I was a huge fan for KFC when I was young, back in Malaysia, especially the chili sauce. Going to KFC was a treat for a poor student. In the 80s, my father organized a treat for his co-workers, and a guy ate 20 pieces of chicken in 10 minutes, a record that nobody could break and was a legend to talk about. Sadly, thing has changed. 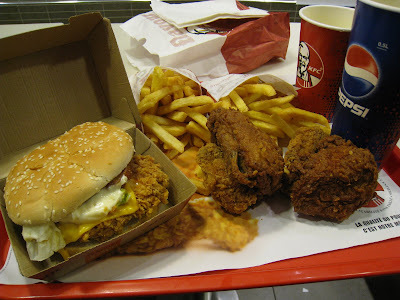 I tried KFC once in USA and it was awful, too oily and big. Worst, when I got back to Malaysia for my favorite KFC, the taste changed too. The smell at the entry was no longer the same. This meal in France, the spicy version was not bad, but the original one was crappy. KFC is simply not popular, even in USA. But in Malaysia, and a friend just told me in Mauritius, KFC is more popular thank McDonald. Yeah, it works countries who eat lot's of chicken. KFC is very famous among Muslim Malaysian in France. because it is so far the only halal fast food outlet (the big like KFC, McD). and it is very cheap. that menu is suggested to be eaten by 4 you know. Do you like it? Does it taste the same like in Malaysia? The one I went to didn't offer set meal like in Malaysia though: 2 pieces of chicken, mashed potatoes, French fried and coleslaw. It's been a long while since my last hanging out at KFC. I missed it though. But not really for poor students though .. It's quite extravagant even for a student dun u think? We ate a fair bit of fast food last year while I was very busy with school works. I often pick up my food at drive through , McDonald, Wendy, and others but I often stopped by at KFC to get their special 7 pieces thigh and wings for $5. Later, I heard from my classmate that Public's fried chicken are even cheaper , a box for less than $5 (I think 12 pieces). But the ones in Public batter was so thick, so I still prefer KFC. I think fast food is convenient for me when I am busy but it is not too healthy in the long run. Now McDonald has came up with a lot of healthier menu like their oriental salad, chicken wrap ( you can choose between grill or friend chicken meat with salad and honey mustard or other kind of sauce), I think it is a great idea. I pick up their chicken wrap a lot through their drive through when I am running from one place to another. McDonald is so creative as far as customized with local flavor and taste. When we were in Hong Kong, we discovered that they sold a lot of pork dishes :). All my coworkers rushed to eat at McDonald, at that times I was just transplanted from Sydney, Aus. and did not know why these people were so excited about Mc. in Hong Kong. Then I realized all these Chinese coworkers were like finding gold when they found out about the pork products sold in Hong Kong's Mc. We American eat out too much because there are so many food chains be it fast food, or franchise restaurants. Along Acher road alone where University of Florida is located, we have more than 50 franchise restaurants from Out Back Steak House (Australian style), Texas Road House steak, TGF (thank god is friday), Olive Garden to you name it we have it restaurants; and we are only a small city with about 100,000 population. It is hard to cook at home when it does not cost a whole lot to have a nice steak dinner or a nice seafood dinner (we are only 1 hour from the gulf and fresh sea food is very abundant) or a nice Japanese or Korean dinner or even a Thai dinner. I have became really lazy with so many options :). And also become fat , fat , fat :).